Are Apps Gobbling Up Your Data? Smartphone users are spending more time using apps than ever before. According to App Annie, people worldwide spent nearly 1 trillion hours on apps in 2016, with most using nine to 10 different apps daily and 30 apps monthly. According to a U.S. Cellular survey1, one of the most popular app categories is entertainment, including photography, social media, video, shopping, gaming, surfing, music, TV, reading and sports. However, on average, we only use one-third to one-half of the apps that we have installed, which means we’re cluttering up our devices with unnecessary and unused app icons. 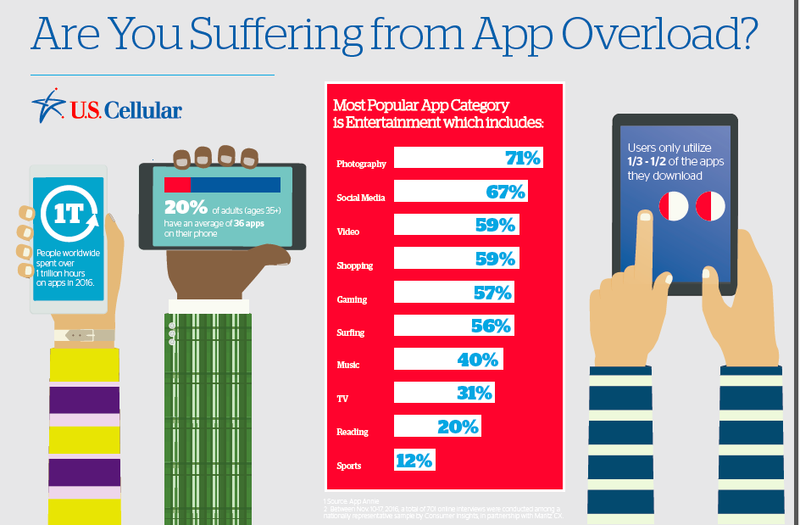 Many people load their smartphones and tablets with an overwhelming number of apps. Then, when trying to complete a simple task like taking a photo, need to swipe through several screens to find the right app on a crowded device. It is easy to see why many mobile device owners suffer from app overload. • Free up some space. It can be frustrating to receive a “no more available storage” message when trying to download a new app or take a photo. Determine which apps are taking up the most space by checking the storage on your smartphone and delete those apps that are old, infrequently used and/or redundant. This can be done through the Storage option in the Settings menu. • Use an app to declutter. 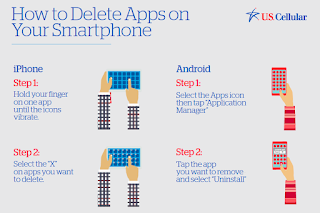 Install an app like Magic Phone Cleaner or DiskUsage to determine which apps to delete. It may seem counterintuitive to install an app to determine which apps to uninstall, but these decluttering tools can be helpful (and can be easily deleted after they’ve served their purpose). 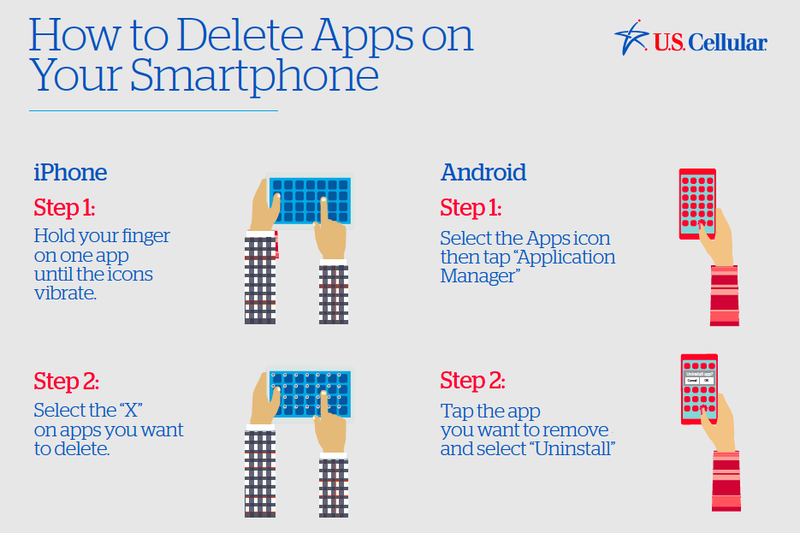 • Delete redundant apps. Many users have an overload of similar apps on their phones. For example, there are multiple choices for note-taking and lists – including SimpleNote, Evernote, and OneNote. Pick one that works and delete the rest. Then cross this item off the “to do” list. Similarly, most mobile devices come with Google Maps as a stock navigation app, but some users prefer Waze, Here We Go, Maps.Me, or MapQuest to find directions, avoid traffic, or seek alternative routes. Since these apps are all quite similar, keep one or two favorites and get rid of the rest. 1Between Nov. 10-17, 2016, a total of 701 online interviews were conducted among a nationally representative sample by Consumer Insights, in partnership with Maritz CX. Out Box Communications is a boutique public relations firm that helps businesses drives awareness, engagement and adoption of products and services through creative ideas, compelling content, innovative promotions and multi-media channels, contact us today to put us to work for you or follow us at @Mwat or @OutBoxComm.